They generally have few friends outside of the fascist community and few interactions that don’t involve other Biffers. Of course that’s not terribly surprising. Paranoid neo-nazis aren’t the most appealing people in the world. They tend to be unreasonable bullies who aren’t used to or even capable of seeing things from anyone else’s point of view. That’s why they’re paranoid neo-nazis. 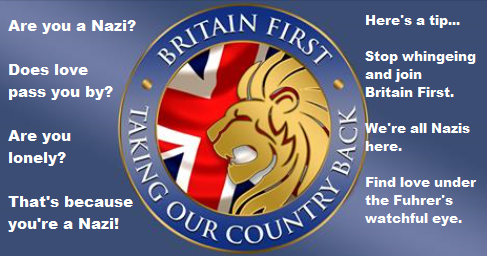 So now we know why they’re so committed to Britain First. No other organisation would ever accept them and they have no normal friends because they’re nasty, paranoid neo-nazi scumbags. So of course, the prospect of women eager to breed (as per the Fuhrer’s instructions) is an added attraction for the lonely little cockwombles.